We do not have a set time or date for this event. Please stay turned for further details and information. please contact iasarhelo@gmail.com with any further questions regarding the event. Come join us at Indianapolis Metropolitan Airport, to spend time and fly with the Sea Cadets! We will be hosting this amazing event at hanger #9. Everyone is welcome! Bring your family and friends for a once in a lifetime experience! For further details and information. please contact iasarhelo@gmail.com. Flights will start between 2:30pm and 3pm, and will run accordingly. For further information about the event, please visit here, or contact The White River Yacht Club @ 317-251-0344. Come join us at Indianapolis Metropolitan Airport. Bring family and friends to spend a day with IASAR up in the air and in hanger #9. For further information about the event, please contact Sean Dixon @ (317) 340-8868 or visit here. Get ready for an action packed day! This is much more than just a ride. There will also be resources for veteran services, helicopter rides, live music, food, prizes, raffles, the Remembering Our Fallen from Indiana touring photo display, and much more. 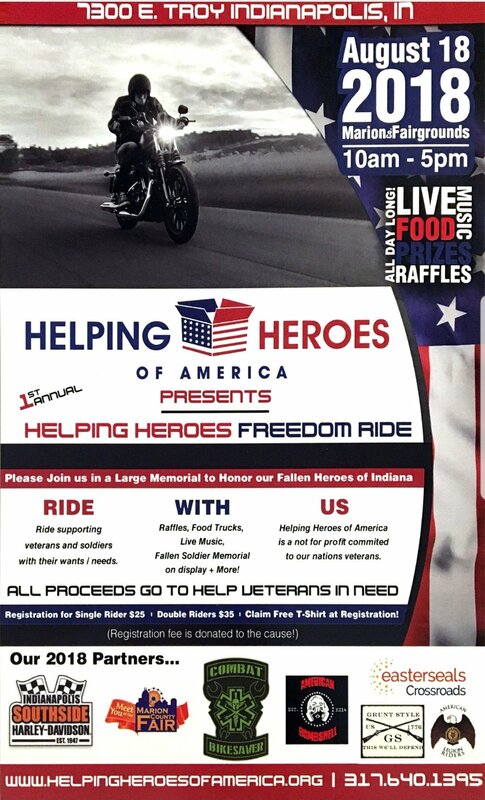 Starting at 8am going until 12:30 pm, we will be giving memberhship flights @ the Helping Hero's of American Freedom Ride, located at the Marion County fairgrounds. As soon as we are done at the fairgrounds, we will be headed over to the White River Yacht Club for our annual open house. For further information about the event, please contact Charlie Walker at autorotateone@comcast.net.